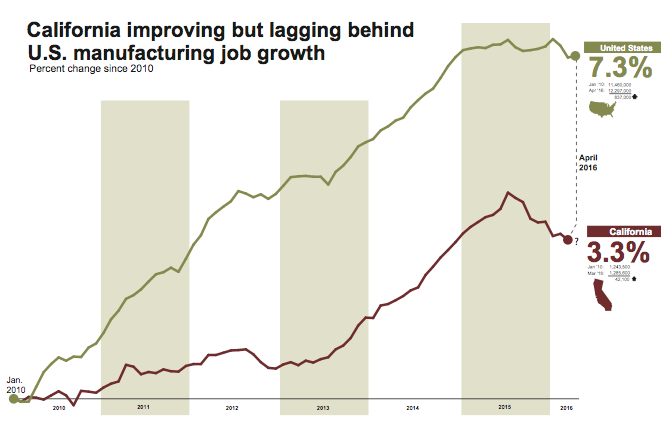 Manufacturing is actually thriving in the United States. Companies are increasingly choosing to relocate to the US due to wage growth in developing countries, logistical concerns, and poor intellectual property protection outside the US. It’s a good thing, too, because the direct jobs and ripple effect of manufacturing in the broader economy makes the US a powerhouse nation. A recent study by the MAPI institute showed that each manufacturing job supports a whopping 3.4 other non-manufacturing jobs. 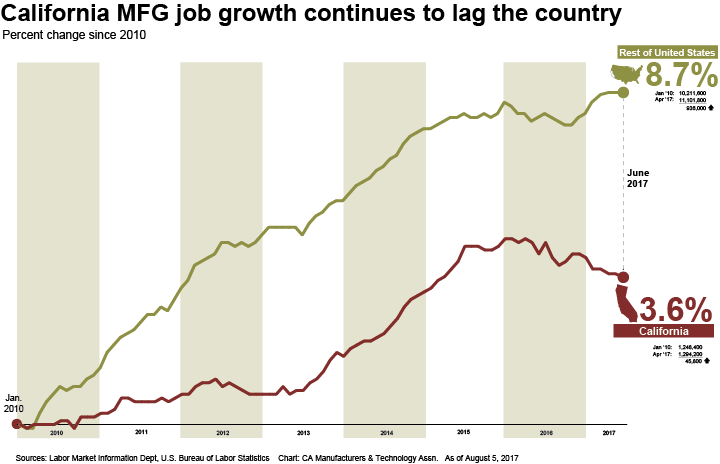 While the US as a whole is becoming more attractive to manufacturing than in prior decades, we have work to do in California. CMTA tracks manufacturing jobs and investment data in California compared to other states. Since the recession ended in 2010 we have seen only slow job growth in California while other states are enjoying the boom. 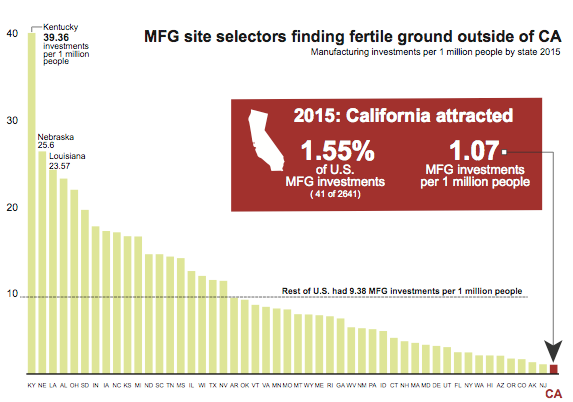 In 2015, California had the lowest rate of all states for manufacturing investments for expansions or new sites. We haven’t received more than two percent of total US investments since the year 2000. That is far short of the 11 percent we need to attract each year to maintain our share of US manufacturing GDP. It’s impossible to attribute any single state policy, even a big one like climate change, to any particular job growth or loss. Many costs of doing business, litigation risks, and permitting challenges discourage investment and job creation in California. But that shouldn’t give lawmakers a pass to not consider economic impacts when they adopt climate change policies. This is especially true when success depends on other states, who want to preserve their strong manufacturing economies, being willing to adopt similar policies and making meaningful reductions in global climate emissions. California voters support climate change laws but also want to protect manufacturing. In a recent poll by the California Business Roundtable, when asked if they support new climate change regulations the answer is a resounding “yes.” But when asked if they would support these policies if middle-class manufacturing jobs would be lost, 66 percent said they opposed. Reasonable regulations can be developed to achieve both environmental and economic goals for California. Manufacturing jobs in California produce greener and cleaner products for the world. It’s good policy and good politics to make sure manufacturing, in particular, is part of the climate change agenda.